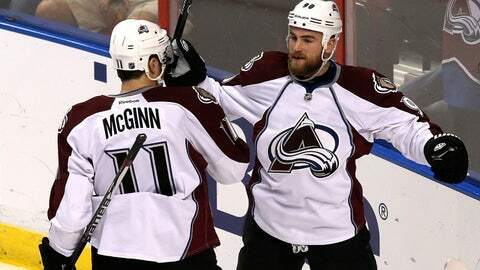 Avalanche center Ryan O'Reilly celebrates his goal against the Panthers with left wing Jamie McGinn. Ryan O’Reilly is on a roll. O’Reilly had a goal and an assist to lift the Colorado Avalanche over the Florida Panthers 3-2 on Friday night. O’Reilly wasted little time in making his presence felt. His goal came at 1:34 in. Matt Duchene missed a wraparound shot but O’Reilly grabbed the rebound and sneaked it past Thomas in the corner of the net to make it 1-0. The goal was O’Reilly’s team-leading 19th, a new career high, and his fifth in the past six games. "If you put doubt in their minds, that’s a huge thing. Getting a couple early is always going to set them back," O’Reilly said. "We started good and that start won it for us." Jamie McGinn and Paul Stastny also scored for Colorado and Semyon Varlamov made 34 saves. Colorado won for the fifth time in six games. Scottie Upshall scored twice for Florida. Tim Thomas stopped 22 shots. The Panthers lost for the first time in three games. Trailing 3-0, the Panthers scored twice in the third to make it interesting. The Panthers made it 3-1 on Upshall’s goal at 5:18 of the third. Tomas Fleischmann swept the puck from behind the net to Upshall in the crease. Upshall pushed the puck past Varlamov’s right leg and into the net for his 100th career goal. Tom Gilbert’s slap shot with 1:43 left in the game from the point deflected off Upshall’s foot and past Varlamov, who was screened on the play, and made the score 3-2. "We were playing desperate. I thought we picked up our pace. We were kind of carrying the momentum," Upshall said. The Panthers outshot Colorado 20-6 in the final period, including 15-0 in the last 13:13. "We certainly had urgency in the third. We had a ton of chances to tie it up and it didn’t happen," Panthers coach Peter Horachek said. Colorado stretched its lead to 3-0 in the second. O’Reilly passed from behind the net to McGinn in front and he fired it past Thomas on the stick side with 7:00 left in the period. "He’s been outstanding," McGinn said of O’Reilly. "He’s been consistent every game. He works hard, on and off the ice and it’s paying off." Colorado is 26-0-2 when leading after two periods. "We were outstanding in the first two periods.Unfortunately the third was not as good and this is something we have to be better at," Avalanche coach Patrick Roy said. Colorado took a 2-0 lead on Stastny’s goal. Gabriel Landeskog passed from the left boards to Stastny in front and he backhanded it past Thomas at 16:13 of the first. In the third period, the Panthers set a dubious franchise record of 38 power play attempts without a power play goal, dating to Nov. 10-Dec. 1, 2010. It’s the league’s longest drought since Vancouver went 36 straight during the 2012-13 season. NOTES: Avalanche forward Alex Tanguay returned to the lineup after missing 36 games due to knee and hip injuries. … The Avalanche played the first of three road games in four days. They are at Tampa Bay on Saturday and Dallas on Monday. … Panthers rookie Aleksander Barkov missed the game with a lower body injury suffered in Tuesday’s game at Buffalo.